. :: The Ealing Comedies ::. The first volume contains the classics Kind Hearts and Coronets, The Man In The White Suit, The Ladykillers and The Lavender Hill Mob. In Kind Hearts and Coronets, Sir Alec Guinness plays a total of 8 different characters, and Dennis Price co-stars as the Edwardian gentleman Louis Mazzani, who plots to avenge his mother's death by seizing the dukedom of the aristocratic d'Ascoyne family. but to gain control of the family inheritance, he must first rid himself of the family, a line of eccentrics including General d'Ascoyne, Admiral d'Ascoyne, The Duke of Chalfont, Lady Agatha, and a further four. In The Man In the White Suit delivers one of his most beloved performances as Sidney Stratton, an eccentric ch3emist who one day invents a fibre that never wrinkles, wears out, or gets dirty. When the mill owners and workers hear of this, they both realise that this miracle fabric will destroy their industry, and Sidney suddenly becomes the most hunted man int he nation. Can a young idealist trapped between big business and mad unions find safety in science or will the future of Britain become unravelled bu one extraordinary whtie suit? Sir Alec Guinnes gives one of his most unforgettable performances in The Ladykillers as Professor Marcus, the mastermind behind a gang of vicous bank robbers who rent a room from an elderly widow, Mrs Wilberforce. When the dear old woman begins to meddle in their perfect crime, the crooks decide that she must be killed. But after a daring heist, a runaway parrot, and several cups of teas later, can the most diabolical criminals in London still manage to murder one sweet old lady? This is also notable for the performances of Herbert Lom and Peter Sellers, pre-Pink Panther. 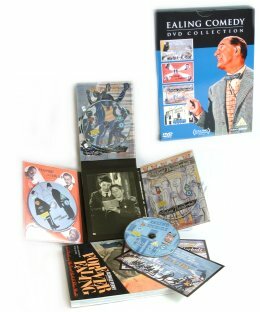 The last disc in the set is the The Lavender Hill Mob. Starring Sir Alec Guinness and Stanley Holloway, this film won the 1951 Academy Award fro best film screenplay. Guinness plays Henry holland, a meek clerk who devises an ingenious plan to rob a fortune in gold bullion from his own bank. but when henry and his odd accomplice melt the gold down into souvenir Eiffel Towers to smuggle to France, their perfect crime becomes a disastrous caper of Cockney crooks, customs chaos and an ill-timed group of British schoolgirls, all leading to some of the msot hilarious and unexpected surprises in criminal history. Like its counterpart, the second volume is a digipack set with a total of four discs and some postcards of the film posters, and this neatly rounds off what are the best of the Ealing stable. Passport to Pimlico, Hue and Cry and The Titfield Thunderbolt are joined by the documentary Forever Ealing, introductions by Martin Scorcese, Terry Gilliam, Steven Frears and John Landis and theatrical trailers for Passport to Pimlico and The Titfield Thunderbolt. Set in the 1940s, Hue and Cry, sees Jack Warner and Alastair Sim as members of an East End gang who use a boy's paper as a means of passing on information and messages to the criminal fraternity. A group of local boys discover this, and take great exception to their favourite read being used in this way, and set out to stop it. Passport to Pimlico has to be my favourite film and one that I never tire of. The plot is simple, after and unexploded bomb goes off, an archaic document comes to light revealing that the district of Pimlico has, for centuries, technically been a part of France. With rationing still in force in Britain at the time, this is the ideal opportunity to escape the drabness and austerity of the time, however, the authorities have different ideas and do their best to dampen the residents enthusiasm. This film was both Academy Award and BAFTA nominated and stars Stanley Holloway and Betty Warren. The last film in the set is The Titfield Thunderbolt is the first of the Ealing Comedies to be recorded in Technicolor. An antiquated railway line is threatened with closure, and the villagers decide to run it themselves, entering into a frenzied competition with the local bus servce. This film stars Stanley Holloway and Sid James and is true to the ethos of Ealing comedies that 'small is beautiful and big is bad'. The bonus disc, Forever Ealing, is a 50 minute documentary giving and insight into the most successful British film studio. Stars and crew from Ealing's past relive old memories and some of the greatest contemporary filmmakers give their thoughts on how the studio inspired and influenced their won productions. Daniel Day-Lewis, whose grandfather Micheal Balcon owned and ran the studio during its most successful phase, producing over 100 films in the process, narrates the documentary. With a price tags of around £39.99, this is no dearer than the originals released on video, and gives you a unique chance to have all the extras, including Forever Ealing. To anyone who is serious about British Comedy, these two volumes are a must for your collections.